We are a locally owned and operated family business with over 20 years of bail industry experience. Father and son team Dale and Kevin Hamilton opened up their first office located conveniently across the street from the front steps of the Sussex County Courthouse in Georgetown, Delaware in 2011, and in early 2014 they decided to expand to the area with a brand new office in beautiful downtown Delaware next to the Schwartz Center for the Arts, just a short walk from the Courthouse. 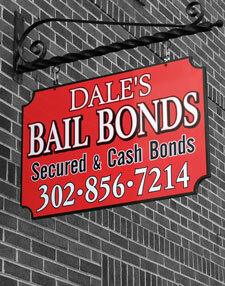 Dale's Bail Bonds provides the fastest bail bond service in the state with over 20 years of bail bond experience! We provide 24 Hour service 365 days a year with two convenient locations in Georgetown. We provide FREE bail information for all callers and offer competitive rates on easy to afford payment plans. We post bails of all sizes, Cash bails and Secured bails. No bond is too big or too small, we post them all!